It’s July 2017 and we have great Jupiter Dermitology specials on hair care, body care and chin care to help you look and feel the best ever this July in Palm Beach and Jupiter. Enjoy sleek, smooth skin with 50% off ALL laser hair removal packages. Buy $250 worth of hair care products, get a FREE hydrating facial. Need hair in a hurry? 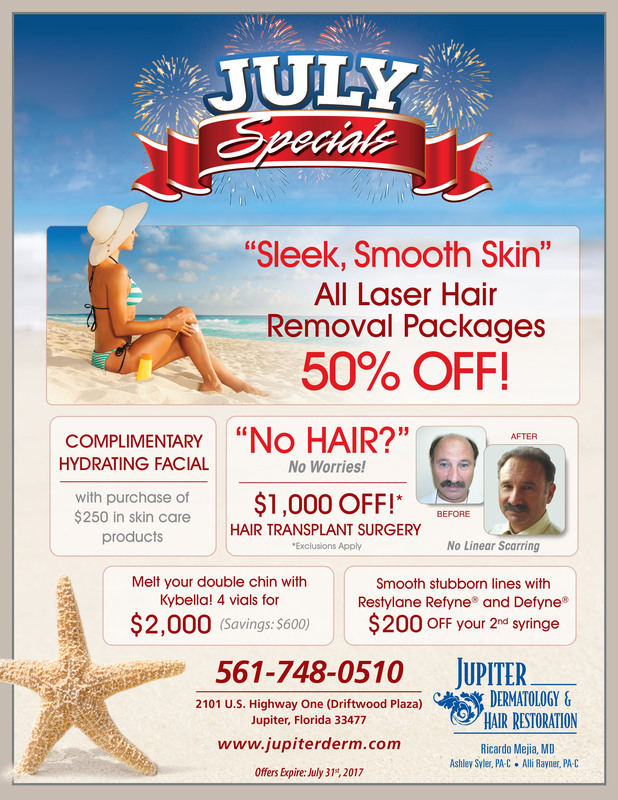 This July sale Jupiter is giving you $1000 off the regular price for hair transplant surgery*. Double-chin worries? Save $600 with Jupiterderm. Grab 4 vials of Kybella double-chin treatment for $2000! Need Restylane Refyne and Defyne? $200 OFF your 2nd syringe. *Conditions apply. See flier for details. These deals end July 31st, 2017. Don’t wait. Book today to get your July Cosmetic Specials from Jupiter Dermatology and Hair Restoration.